alright so not the most exciting sewing ever, but something i’ve been wanting to make for months now and something she actually NEEDS, so it’s pretty satisfying. and that’s what kid’s clothes week is all about, amirite? Em grew out of her uniform pants (and hates wearing them anyway). so even though there’s not much school left, she still needed more options as the weather warms up. i figured this Oliver + S 2+2 Skirt should get her through the rest of the year (and start her off for next too, probably). it’s a 3T with 1″ in added length. 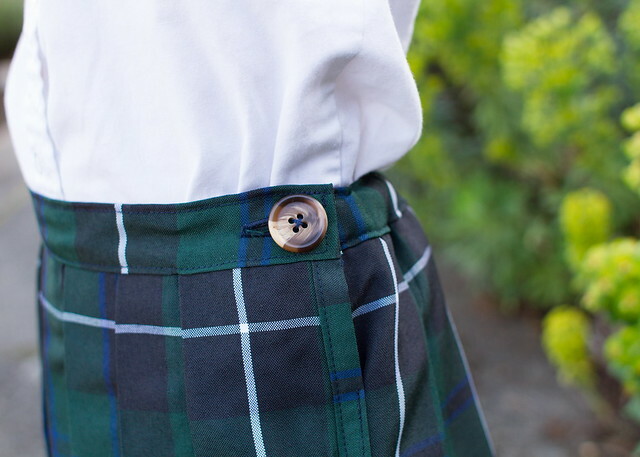 i didn’t do the button loop and instead added a buttonhole on the waistband – i THINK that’s how the “real” uniform skirts close, and i’m supposed to copy them the best i can as you’ll recall. the fabric is from the uniform company; it’s weird polyester that frays like crazy and doesn’t wrinkle but when you DO iron it into pleats, it stays like that through washing. so bizarre. matching plaids is something i just sort of guess at, but i’m pretty sure my mediocre skills still trump the store-bought ones, so any plaid-match imperfections actually make it look LESS homemade if you can believe that. i just love it with knee highs and a peter pan blouse. but it was too chilly this morning for coat-less photos. sorry, Em! quickest photoshoot ever. seriously, like less than a minute. i’m feeling a bit sickish, so i think i need to hit the hay early and hopefully make up for my slacking tomorrow (i finished this skirt at 1am last night, probably not the best idea). anyway…happy sewing, everyone! the skirt definitely takes a while, but this one went together a lot faster than my last one, now that i had the pleating practice. thanks! should say ‘sewing yet’ not ‘cutting out’, I’m new to blogging and (feeling slightly stalkerish posting on blogs of people I don’t know) I didn’t realise you cant change your own comments, I must triple proof before hitting post. oh man, all those pleats must have taken for EVER. But it’s neat that you still get to make her school clothes even though she wears a uniform! Maybe they will switch over to letting all the girls dress like Madeline. Wow Kristin – this is amazing. All of those pleeeeeeeeeeeeats. I would have been cursing my iron less than a quarter way through! You are one talented momma!!!! great job on the pattern matching! Great to sew utility garments they use every day. I also loved the parsley pants from yesterday! You getting a lot sewn! It looks great! I love the plaid! 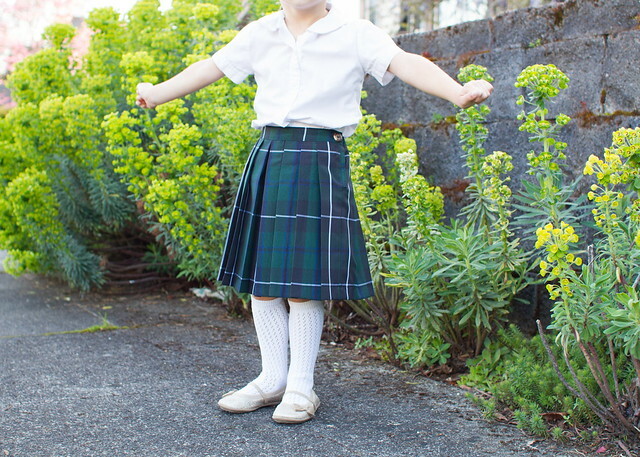 My daughter goes to a school with uniforms too, I never thought of making her one, but that would be fun! i love knee socks too! aren’t they the sweetest? 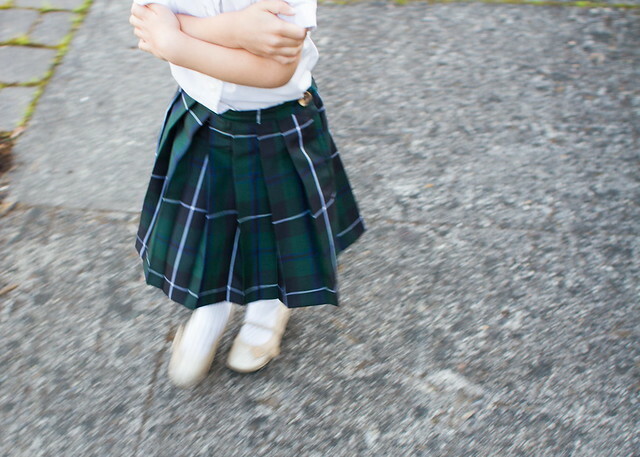 and the peter pan bouse, too – a staple around here for uniform wear. very nice job on the skirt. i love your button choice! yay for practical sewing! that skirt looks like hard work, you did a pro job!! very cute! 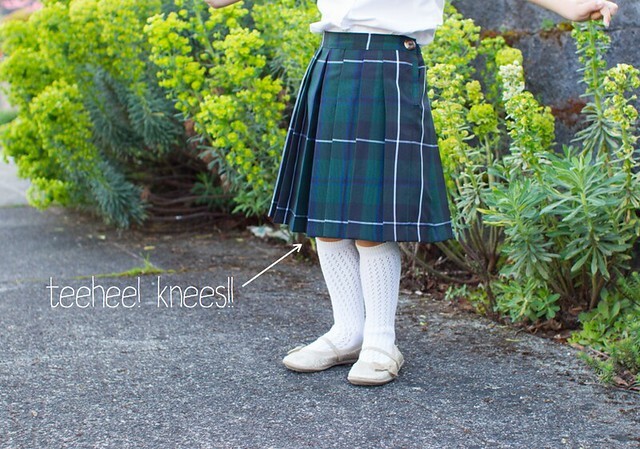 the knee-highs are adorable 🙂 I use to teach kindergarten at a private school, so fun to see those sweet little uniforms again!